Mother Goose Time offers a toddler supplement to their curriculum called “Little Goose.” Inside are tons of tricks and tips for making the main preschool curriculum applicable to younger minds and little bodies. My favorite part of “Little Goose” is a section called “Tray Play.” “Tray Play” is a collection of daily play ideas that can all be completed on a tray. The suggested exercises are perfect to keep my toddler’s hands busy, while I give directions or go over something above his current level with my preschooler. Cover the container and top with construction paper and draw lines to resemble water ripples if you wish. Cut a slit in the lid of the container. You may also use markers to make the craft sticks resemble alligators. I chose not to draw on ours so we could reuse them in a future craft project. Have the kids create a story for why we are rounding up all the alligators. With two or more kids, practice taking turns rounding up the alligators, with each child responsible for a different color or color(s). Have them pick up all the colors except one. For instance, you might pretend that the yellow are impostors and not real alligators at all. Mama Notes: Both my two year old and three year old were obsessed with this activity for a couple of days. Dinner was made and laundry was washed during this activity. There are no messy or wet components and the craft sticks can be stored in the container, so clean up is breeze. The oatmeal container did finally succumb to rough handling and the craft sticks eventually made their way all over the house. We got about 3 solid days of play out of this activity and will do it again. Have the children collect or set out petals, a spoon or stick, and a bowl of water. 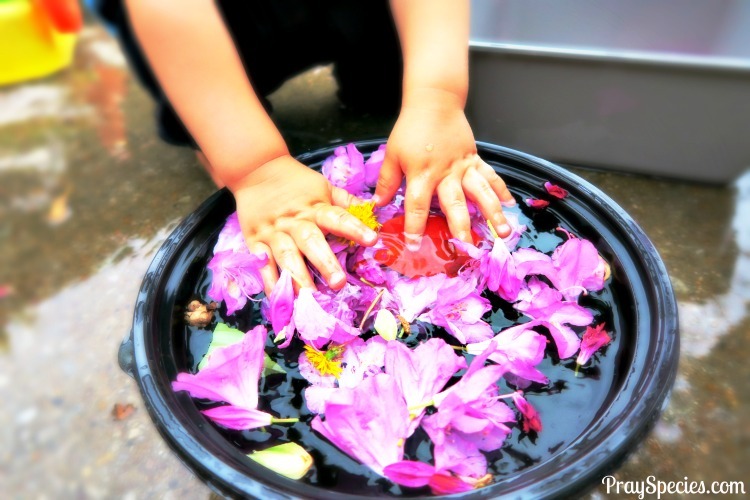 Encourage the kids to pluck off the petals and put them in the water. Observe the water and how the petals move when the water is stirred. As an extension activity, add other nature items to the mix and watch how they act in the water (sink, float, etc.). Consider creating a story behind why you are mixing all these nature items together. Boat Counters – Ours came with the Mother Goose Time curriculum, but these are similar. Cut blue lakes out of the construction paper. Write a number from 1-5 (or as high as you wish) on each paper, then draw the same number of circles on the lakes. Make sure the circle is large enough to surround the boat counter. I traced the top of a circular pill bottle lid and my older daughter (3 years old) helped. Place the lakes and boat counters on the floor or on a tray. Encourage the kids to pick a lake, identify the number, count the circles, and put that many boats on the piece of paper. The boats also lend themselves to color sorting and imaginative play. Mama Notes: This is such a simple activity, but something about having little spaces to fill with manipulatives really appeals to both my toddlers. 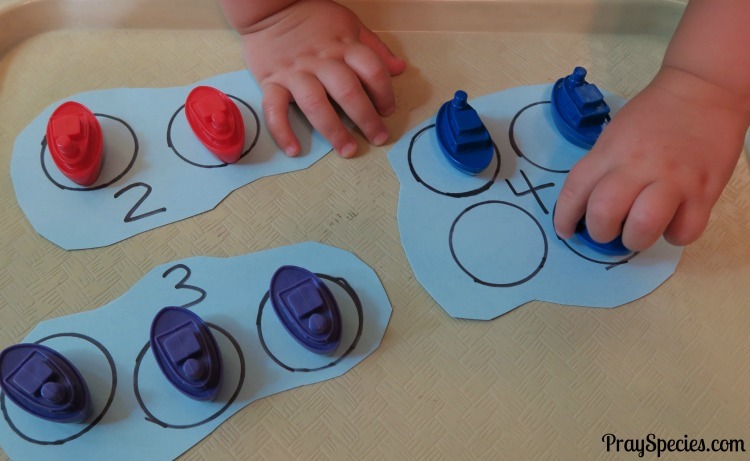 Both of them have increased their counting skills through this type of simple counting manipulative tray play. 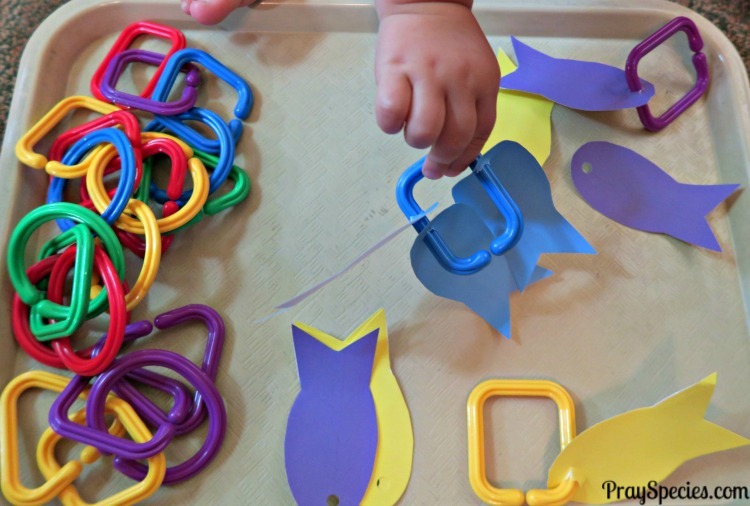 Shape Links – Ours came with the Mother Goose Time curriculum, but these are similar. You could also use pipe cleaners, but my kids love playing with the links. Cut fish out of different colors of foam or other stiff paper. We used card stock. Make a hole punch at the mouth of each fish. Attach a fish to a similar colored shape link as an example. Encourage the kids to attach more fish to the shape links. Match link and fish colors. Count the number of fish as they add them to the links. Mama Notes: My toddler spent most of his time figuring out how to get the fish onto the shape links. My preschooler was busy sorting by color and counting the fish. The holes created by the hole punch are just a tad too small for the shape links to allow the fish to slide on easily, so several of the fish ripped in my toddler’s hands. It worked a lot better for me to put the fish on and then have him take them back off. Once the fish had been on the shape link a few times, the hole was a little bigger and he was then able to add the fish to the shape link himself. Tape colored paper strips or your colored paper inside of a tray. Cover the paper with a layer of salt. 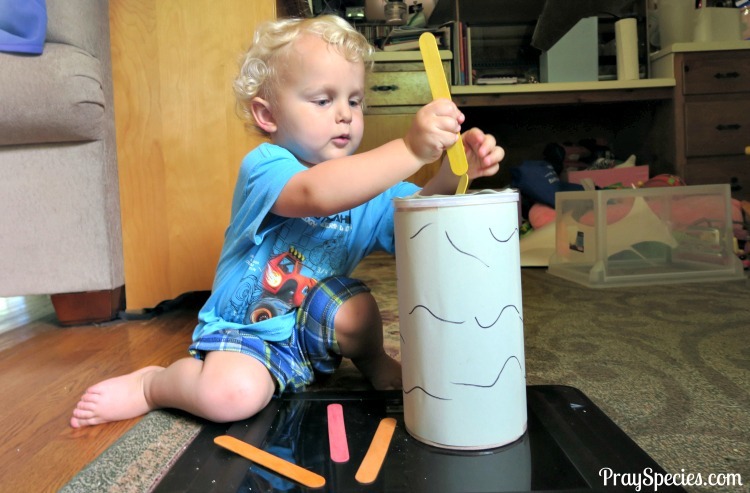 Have the kids use the paintbrush to uncover the colored paper underneath. 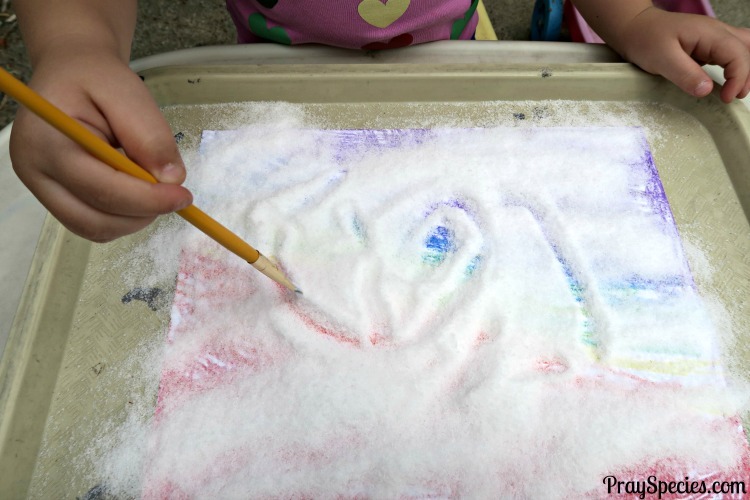 Make designs, letters, or numbers in the salt. Each of these activities gave the kids something to do and kept them busy, but it also introduced them to a variety of play mediums. “Tray Play” spurs creativity and gets kids thinking about how the world around them works. They have fun, I have fun, and we often “accidentally” learn something along the way! I share tons of toddler play ideas, Mother Goose Time activities, book suggestions, and other home school projects!